Relational mentoring is mentoring that is focused on helping people move through all three truths in Foundations. You are helping these people learn to trust Jesus in every area of their life, honor God with their attitudes and actions, and become people who are focused on helping and mentoring others. This is the heart of the mentoring culture that we want to see spread through our churches and ministries. If we are going to fulfill the Great Commission and God’s vision for the church we need to engage in relational mentoring. There are many ways to do discipleship, but relational mentoring involves using pursueGOD.org conversations and the FLEX method. 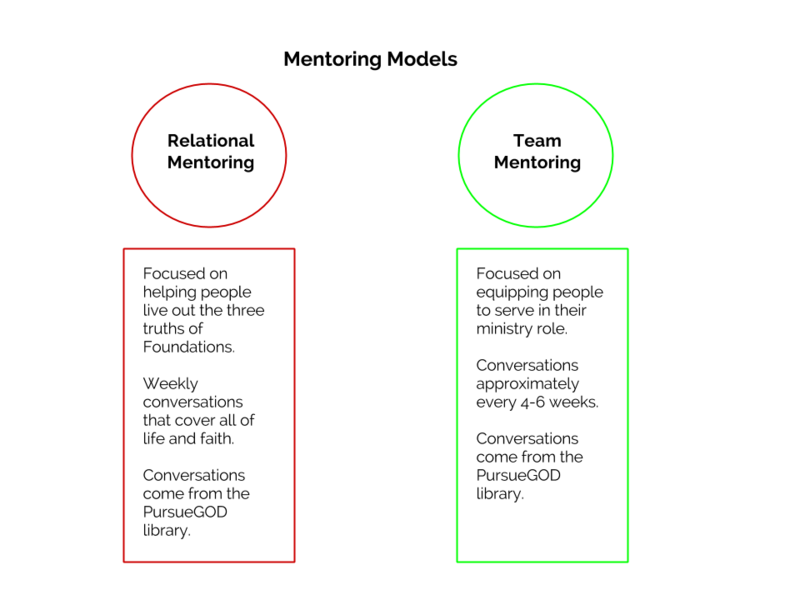 You or the person you are mentoring must choose a conversation or series to go over, watch the video or read the article ahead of time, and then preview the discussion questions. When you get together, have someone summarize the video and then begin the discussion. When they are ready to be mentors themselves, take them through mentor training. How many people can I mentor this way? The answer to this question depends upon your stage of life and your availability. If you have a family, focus on mentoring your kids, your wife (if you are the husband), and then start with just one other person outside of your immediate family. If you are single, or if your kids aren’t in the home anymore, plan on mentoring two or three people. How often do we need to meet for relational mentoring? There is no rule, but we recommend a weekly connection. If scheduling is difficult, meet in person one week, and then over the phone or on a video chat the next week. The goal, though, is regular communication. Can we talk about things that aren’t in the PursueGOD conversation? Of course, if there are immediate needs or problems that arise, address them. Use the conversation as a launching pad, but be sensitive to the needs of the person you are mentoring. Is relational mentoring impersonal? PursueGOD conversations are meant to focus your conversations. They are meant to unlock the door to meaningful conversations that many people struggle to have. If you use pursueGOD.org conversations you will probably have some of the most personal, authentic conversations of your life. Developing truly mature Christians. Relational mentoring is mentoring that is focused on helping people move through all three truths in Foundations. How to do relational mentoring. There are many ways to do discipleship, but relational mentoring involves using pursueGOD.org conversations and the FLEX method. You or the person you are mentoring must choose a conversation or series to go over, watch the video or read the article ahead of time, and then preview the discussion questions. We want to see everyone in church experience relational mentoring and be able to mentor others in this way. Explain relational mentoring. How might it be more or less helpful than other types of mentoring or discipleship? Have you experienced relational mentoring? Explain. Who can you start mentoring this way right now?